During the cluster creation process in Windows Server 2012, Microsoft has added a new option to automatically consume all disks and manage them through Failover Clustering. As a result, any attempts to create a mirror in DataKeeper will fail and a message will be received in Disk Manager that the disk is being managed by Failover Clustering. 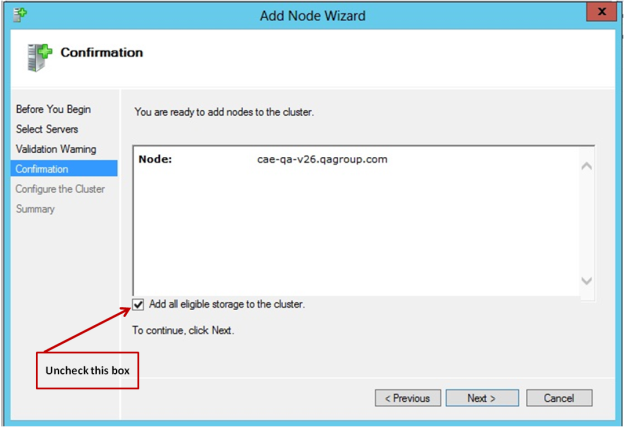 To prevent this from happening, in the Add Node Wizard, uncheck the box marked “Add all eligible storage to the cluster” (shown below). Specific disks can then be added after the cluster is created. To remedy if already being managed by Failover Clustering, remove the disks from Available Storage, then online the disks in Disk Manager and use DataKeeper to manage the volumes.